Set on an isolated beach, the Lara Bay Turtle Conservation Station presides over the shelled creatures who come here every year to nest. Devoted conservationists keep an eye on the green and loggerhead turtles, safeguarding the eggs and young hatchlings and educating the public on the turtles’ plight. The wellbeing of the turtles and their hatchlings depends on delicate circumstances. Therefore, it’s best to visit the Lara Bay Turtle Conservation Station as part of a tour with an experienced guide. The conservation station is often included in safari jeep tours of the Akamas Peninsula, which typically stop at other area attractions like Avakas Gorge and the Baths of Aphrodite. Most tours offer the chance to browse the exhibits in the station and look for hatchlings, depending on the season. Lara Bay Turtle Conservation is a must for nature and animal lovers. If you plan on spending a few hours at the beach, bring water and snacks. Neither the conservation station nor the beach are wheelchair friendly; rocky and uneven surfaces make access difficult. Lara Bay Turtle Conservation Station is on Lara Beach, about 17 miles (27 kilometers) north of Paphos, Cyprus. The access road to Lara Beach is rough and unpaved; it’s best suited to travelers with a four-wheel drive. Egg-laying season usually lasts from May to August. This is the best time to go—you’ll have a higher chance of seeing newly hatched turtles in the conservatory’s water tanks. Wildlife thrives on the remote and undeveloped Lara Beach, and turtles aren’t the only species you might spy. You may also see goats, as well as mouflons, a kind of wild sheep unique to Paphos. Nearer the shore, you may spot seals, which are known to frequent the nearby sea caves. 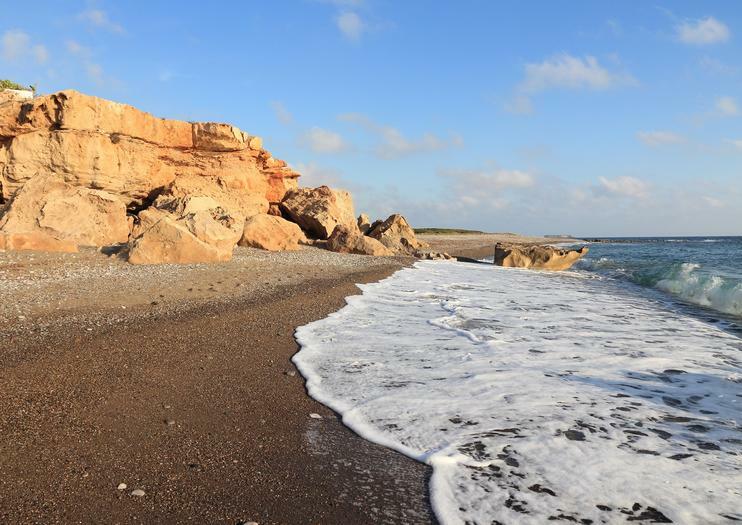 Explore the beautiful nature of Cyprus with this day trip form Paphos. Stroll around scenic limestone-clad Avakas Gorge. Walk along the Lara Bay and gawk at indigenous turtles nesting in their natural habitat. Discover Ayios Georgios, a church dating back to the sixth century. And then take some free time to wander on your own.